*if you have issues logging into the Parent Portal, contact your current school. Students new to CUSD must click the icon below to register and establish residency first. All District students entering 9th grade must declare which high school they wish to attend in the Fall of 2019 by submitting their high school selection online during the filing period beginning January 1, 2019 and ending on January 31, 2019. Students who are currently enrolled in grades 9, 10, and 11 who wish to remain at the same high school for the 2019/2020 school year, DO NOT need to participate in the selection process. They will automatically be enrolled in their current school for the following year. Only students who wish to change schools must declare which high school they wish to attend by submitting their high school selection online during the filing period beginning January 1, 2019 and ending on January 31, 2019. Any students who are not currently enrolled in a CUSD school but live within the CUSD boundaries, (i.e. currently enrolled in private schools or will be new to the district), must first establish residency and complete enrollment paperwork for the 2019-20 school year. During this process, they will be prompted to declare which high school they wish to attend in the Fall of 2019. They may do this during the High School Selection period from January 1, 2019 through January 31, 2019 or anytime thereafter. Students who move into the District after the High School Selection window has passed may declare a high school choice after establishing residency. However, if the desired school does not have space available, these students may be assigned to the high school with lower enrollment. Changes to a student's high school selection may only be made during the open enrollment period by changing your selection in the Parent Portal. Changes after the close of the selection process on January 31, 2019, may not be accepted per Administrative Regulation 5116.2. 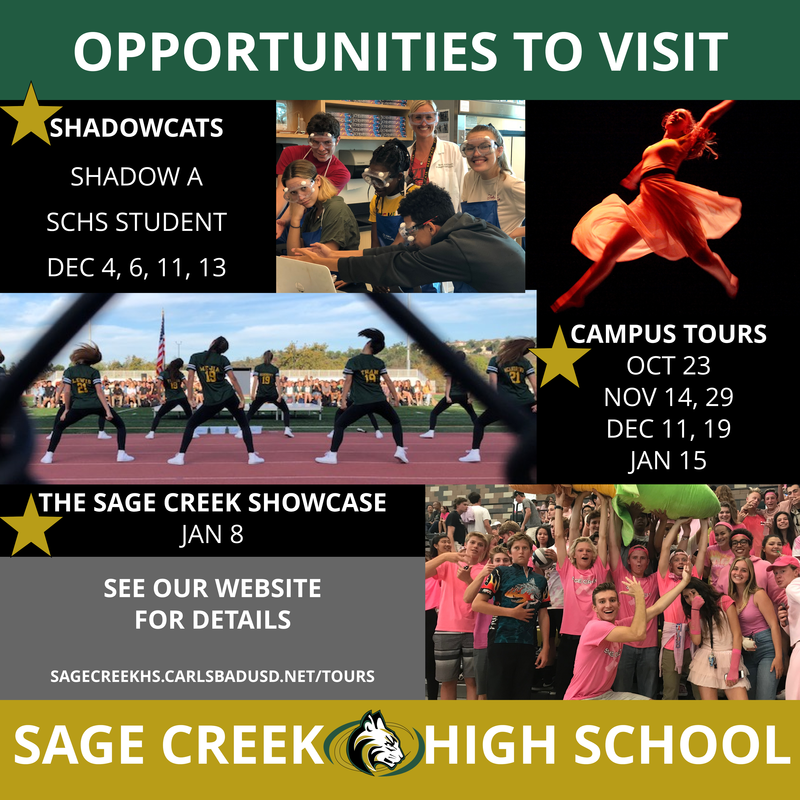 If necessary, a lottery will be conducted using a Random Number Generator for Sage Creek High School on February 15, 2019, with results mailed to students and parents on February 25, 2019. All students participating in a lottery would need to prove residency before their spot is officially reserved. Special Education services vary by school site. Please refer to your IEP Team for the most appropriate placement for your child. The submitted high school selection is final at midnight on January 31, 2019. Changes may not be permitted after the application deadline per Administrative Regulation 5116.2. Late applicants (filing AFTER January 31, at midnight) may not be accepted. Students who have not selected a high school during the High School Selection Window (January 1, 2019 and ending on January 31, 2019) will be assigned a high school determined by the District based on enrollment numbers and capacity.